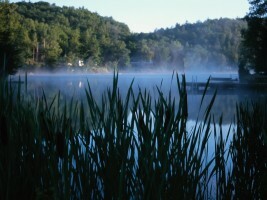 Did you know there are over 900 Muskoka lakes in this most famous region of Ontario cottage country? Imagine, literally hundreds and hundreds of beautiful lakes with warm silky smooth waters just waiting for you to experience! It’s the sheer number of fresh water lakes in Muskoka, and Ontario in general that makes this destination an envy of the world. Other world class destinations may have their own magnificent natural wonders but there is nothing as pleasurable as looking across a mirror still lake and taking in the pinkish red hues of the setting sun as another day gives way to night while silhouettes of majestic pines flicker softly over the lake and a loon gently breathes its soothing call. And you probably only knew about the big four Muskoka lakes (Joseph, Rousseau, Muskoka and Lake of Bays) that make up 30% of the lake surface in Muskoka. But we have got great information about many of these and the other two thirds of the fresh water lakes in this area that are often overlooked – but no less beautiful. Whether you are interested in what kind of fishing is available, swimming, boating, paddling, canoeing or whether you are interested in learning about great lakes for cottages to vacation in or retire, you’ll find this growing list super helpful. We describe all of the lake activities they are great for and also what kind of access there is to each lake, whether they are secluded or how popular they are for cottages. So if you are doing research about future areas for day tripping recreation activities, camping, or good areas for cottages to buy or maybe build in the future, this is great place to get educated. Our Lake Ontario list is growing and our goal is to strive to give the most comprehensive list available. If there is a particular lake we missed or you think deserves mention, please Contact Us. We’d love to hear from you. I am currently looking to purchase property and found something on Fawn Lake. Your website claims it to be in Gravenhurst. It is in Port Sydney in Muskoka, between Bracebridge and Huntsville.